Doesn't this look fabulous? It tasted just as fabulous too! This is the "Nuts About Spinach" salad on the menu at The Pool Restaurant, located inside the Henry Ford Estate in Dearborn, Mich. You may remember that I did a previous blog entry about the restaurant at the mansion earlier this summer. This salad was BIG, and it better be for the $9.95 price! 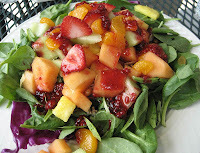 LOL Baby spinach leaves were topped with melon, strawberries, mandarin oranges and Michigan dried cherries. Underneath all the fruit were the almonds, walnuts and soy nuts. Raspberry vinaigrette came with the salad on the side. I couldn't resist... I poured the whole cup of dressing on top cuz the vinaigrette was divine! It had a nice, thick texture to it, not runny at all. Tasted very fresh, too. Wow. That salad looks yummy. I would almost try it and I don't like lots of things all mixed up. Thanks for reading Barbie's adventures! Eating out at the "Mo's"
BBQ Pomegranate Tofu with Coconut Rice.